Jeffrey Fourmaux represents public companies, investment funds, banks, and other clients in complex commercial litigation, often in matters of national and international importance and first impression. 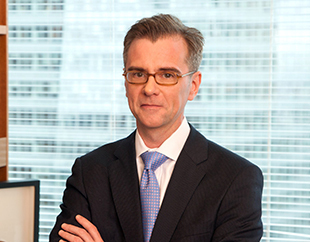 His work focuses on creditors' rights, securities matters, and litigation arising in connection with mergers and acquisitions. Representation of U.S. Bank National Association in its capacity as indenture trustee of certain notes issued by Windstream Services, LLC in connection with litigation concerning an alleged default under the indenture. Mr. Fourmaux and the firm litigated the matter through trial, with the court ultimately ruling in favor of U.S. Bank on all points, and finding that Windstream had in fact breached the indenture. Over the course of nearly a decade, Mr. Fourmaux and the firm represented two hedge funds pursuing claims against the Republic of Argentina to recover on defaulted bonds. The firm's clients recently finalized a settlement with the Republic in which they recovered approximately $1.3 billion. The litigation involved novel issues of contract, creditor and judgment enforcement law, and their intersection with the Foreign Sovereign Immunities Act. Representation of the Special Litigation Committee of Aetna in connection with its proposed merger with Humana. Representation of a U.S.-based investment fund against 48 subsidiaries of the bankrupt Mexican glass maker Vitro, S.A.B. de C.V. in a complex case involving non-payment of guarantees on the parent corporation's bonds. Despite the companies’ attempt to circumvent their duties and argue that the U.S. courts should extend comity to the Mexican bankruptcy proceeding, Mr. Fourmaux and the firm prevailed both on summary judgment in New York state court, as well as won an affirmance on appeal. Ultimately, the client reached a favorable global settlement of its claims. Representation of a major bank as a defendant in an interpleader action with hundreds of millions of dollars at stake brought by the trustee of a student loan indenture concerning the way in which payments should be made under the waterfall of the indenture. Representation of a real estate investment fund in connection with a successful effort to enjoin a margin call made by an international bank that would have put the fund out of business. Representation of Wells Fargo & Co. and Wachovia in connection with a multibillion-dollar dispute with Citigroup arising out of the acquisition of Wachovia by Wells Fargo during the financial crisis. Prior to joining Friedman Kaplan, Mr. Fourmaux practiced at Wachtell, Lipton, Rosen & Katz LLP. Bankruptcy Court Confirms Revised Chapter 11 Plan for Nine West Holdings, Inc.